We left for the Galapagos on Wednesday and have had a marvellous sail so far. We have discovered that ANGEL actually CAN sail in very light airs. We have actually been attaining 4 knots over ground with just 5-7 knots of wind. Dave has made the amazing discovery that he LOVES sailing. No longer is the destination the prime objective. Now the journey itself is important. We had an indication today that we are in for a wondrous time in the Galapagos. This has been a dream of mine since I first heard of it in grade school and I can't wait! This evening there was a breathtaking display of almost two dozen dolphins leaping over the waves in single file. Then, just before sunset, a red-footed booby chased off competitors to take up its nighttime roost on the pulpit at the bow of the boat. Then, shortly before midnight I witnessed a spectacular magic show! I heard the persistent clicks of the huge bats that have been accompanying us nightly and went out on deck to watch them. As the hull was rising and falling in this biologically rich water, waves of starry bioluminescence swept out from the sides of the boat. Some of this light must have reflected off of the bats and they took on the appearance of glow-in-the-dark butterflies. Then I heard the puffing sound of dolphins nearby and looked down to see a half dozen dolphins racing through the water to surf off of our bow wave. Of course, they too were streaks of neon green shooting in all directions. The scene was worthy of the special effects in Ghostbusters! This brilliant pyrotechnical- like display lasted almost half an hour. I was enthralled, to say the least. I moved forward to lean on my arms on the pulpit in order to drink it all in. 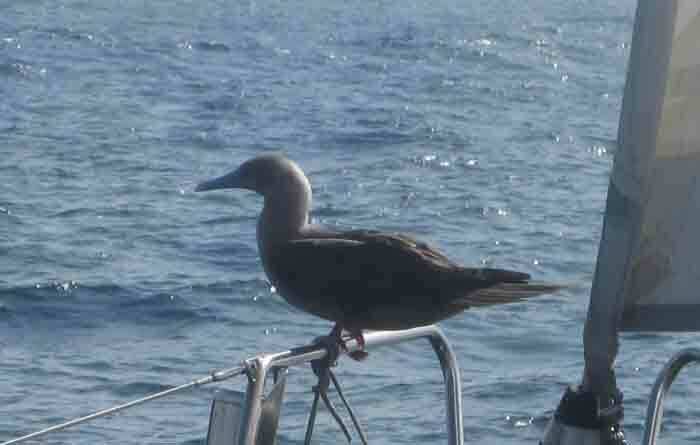 I felt a presence near me and looked up to find myself nose to beak with our hitchhiking booby! It didn't budge a centimetre and looked at me with a superior air of disdain!